“Fans of Jojo Moyes will enjoy AJ Pearce’s debut, with its plucky female characters and fresh portrait of women’s lives in wartime Britain” (Library Journal)—a love letter to the enduring power of friendship, the kindness of strangers, and the courage of ordinary people in extraordinary times. “Headlined by its winning lead character, who always keeps carrying on, Pearce's novel is a delight” (Publishers Weekly). 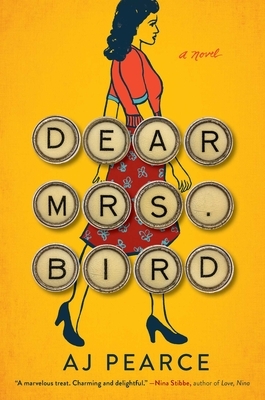 Irrepressibly funny and enormously moving, Dear Mrs. Bird is “funny and poignant…about the strength of women and the importance of friendship” (Star Tribune, Minneapolis). “There is more to this very English novel than first meets the eye . . . a delightful read — funny and poignant . . . It is about the home front during war, yes, but even more it is about the strength of women, the importance of friendship and the toll of stoicism. "Set against a backdrop of war-torn London, this is a charming and heartfelt novel. Pearce brings to life a tale of true friendship, and how love will outlast even the most challenging times." "The sweetest, most uplifting, lovely book about courage, friendship, love." "Clever... The novel has a wonderfully droll tone, a reminder of the exuberance of youth even under dire circumstances. Headlined by its winning lead character, who always keeps carrying on, Pearce’s novel is a delight." "A winning wartime romp, as hilarious as it is moving . . . the novel's spirit is madly winning, and its foregrounding of wartime women seems spiffingly modern."